Apple has today released the public beta 4 seeds of iOS 10.3 and macOS 10.12.4 for download to users registered as testers on Apple Beta Software Program. 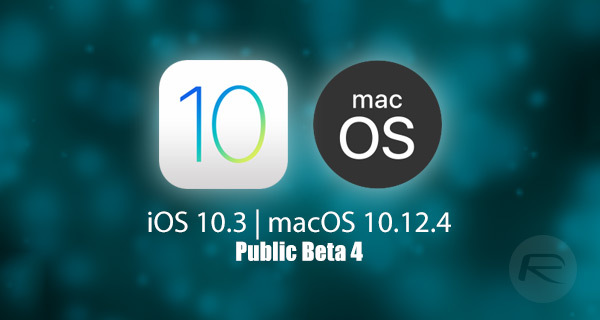 After initially being issued to developers yesterday, the fourth betas of iOS 10.3 and macOS 10.12.4 are now available for all public testers to download onto a compatible iPhone, iPad, iPod touch, MacBook, or iMac. This release not only gets iOS 10.3 and macOS 10.12.4 closer to a public release, but also instantly expands the pool of individuals testing for stability. As expected, beta 4 of iOS 10.3 doesn’t exactly ship with tons of new features or user-facing improvements. Apple has taken the liberty to include a new message on screen which informs users of an impending reboot when they hold a button during an update process. The company has also issued some fixes for sounds made when Find My iPhone locates AirPods, as well as providing some love around the iCloud backups process. Aside from those minor changes, we have a platform which looks to take a step closer to a public release. A platform which will bring a new internal file system, called Apple File System, or APFS. A platform which introduces CarPlay improvements. Siri improvements. And even more powerful access to SiriKit to allow developers to produce better and more powerful voice-capable applications for iPhone and iPad. Assuming you already have a beta configuration profile installed on your device, you can grab this latest release via the Software Update mechanism through the native Settings app (Settings > General > Software Update). Those new to this can head over to beta.apple.com to get up and running with public betas. Apple clearly understands that macOS won’t be getting as stringently tested from external testers as much as iOS will. After all, more people are walking around with an iPhone or iPad than have a MacBook or iMac sitting as a test device. With that said, those who are testing the platform will be able to take advantage of the new Night Shift mode which automatically changes the color temperature of the display. Apple has also introduced a new found ability for developers to reply directly to App Store reviews on their apps. Aside from those new inclusions, beta 4 is very much a bug fix and development release which looks to get it ready for a public release via the Mac App Store. For those interested in testing but are new to this can head over to beta.apple.com to register themselves in Apples Beta Software Program and get started. Already have a previous beta of macOS installed? Head over to Updates tab on Mac App Store to grab this latest version of macOS 10.12.4 beta. Update x1: Apple has also made available to download tvOS 10.2 beta 4 to developers.